The aim of this guide is to teach store owners not just the steps on how to add an About Information/About section to their Facebook Fan Page, but also to optimize its use as a marketing strategy. 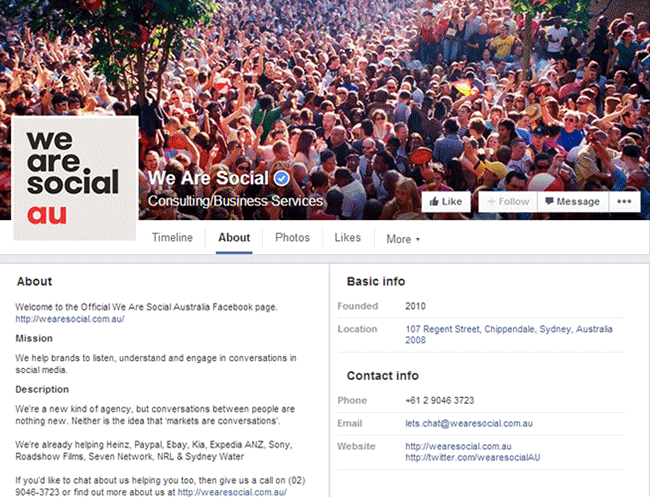 Each Facebook Fan Page has an About page. This is where we can put information about the store, its location, contact numbers and what it does. Most store owners do make use of the About Page however, they write something ordinary and uninteresting contents. 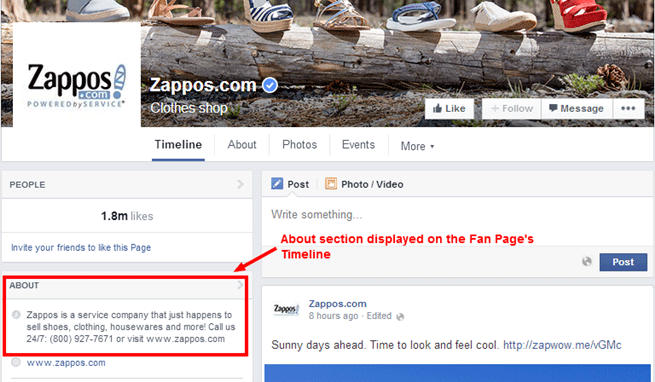 Most store owners might have ignored this, but the About Page is something that we can optimize as a marketing strategy to increase the number of fans as well as to direct fans to the main store page. 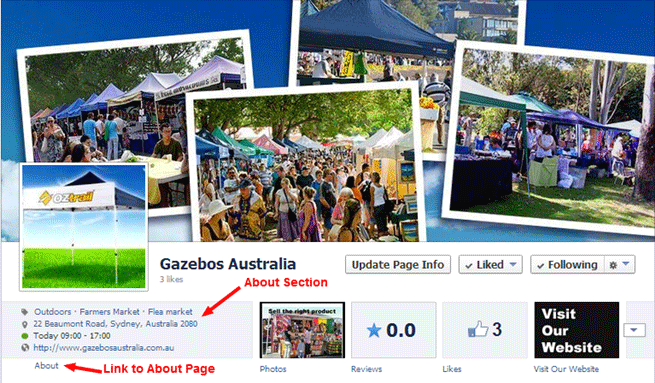 You can add your store’s Information on the About Page of your Facebook Fan Page. This will let your fans and potential customers know more about you, your company and the products you are offering. Facebook provides different types of information for you to fill out, depending on the category that you’ve selected for your Page. It is important to use accurate and updated information so that people can easily learn from you and contact you in any case. Click on Edit Page button at the top of your page. And click on Update Page Info option. Select which information you wish to edit and update and click on the Edit button. Note that the Short Description will appear on the About Section on your Timeline. Click on Save Changes button once you’re done. 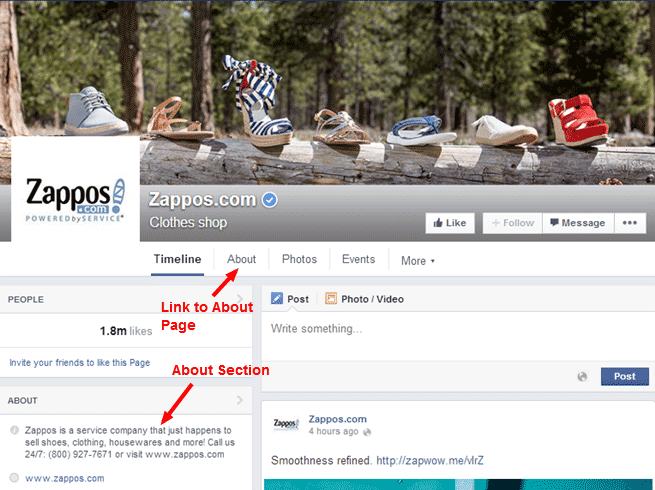 With different categories available, About pages for every store might appear differently. What’s important is that you provide an engaging and compelling About pages to draw your fan’s interests in. 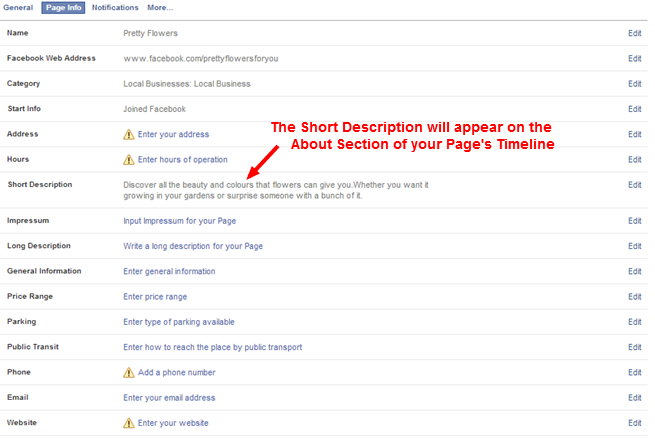 Aside from the About page, Facebook will also let you display a short About Section on your page’s Timeline. To be safe, keep it around 140 character limit. 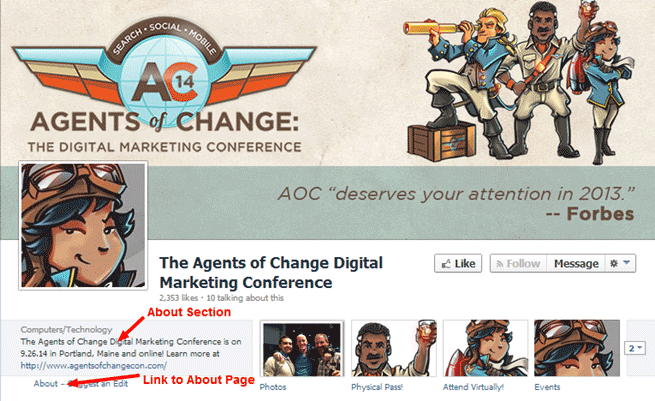 Note that Facebook displays your About section differently depending on the category you used for your page. 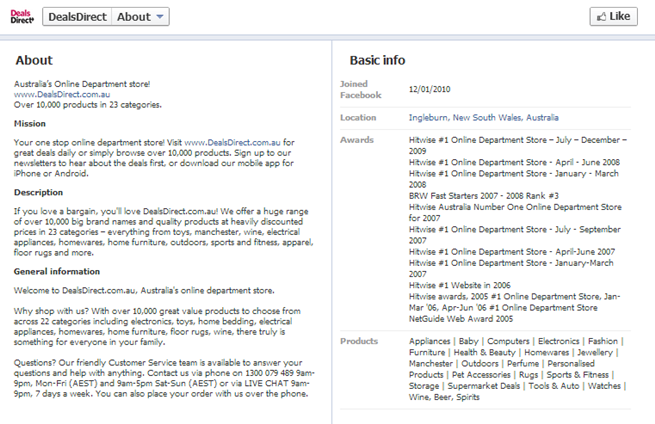 So you might notice that About sections of other store’s pages appear differently from yours. The About Section will provide your fans and readers a glimpse of your About Page. Effective About Section will draw your fan’s interest on knowing more about your store and checking your About Page as well as your store’s URL. However, the About Section is more important than that. The About Section does not only provide a brief information about your store, it is actually very useful both for Search Engine Optimization (SEO) and to your Facebook fans. As the Meta Description for search engine. With this, it is important to include rich and attractive keywords to win clicks. This can help people find your page on the Search engine. To display your store’s URL. The About section can be easily found compared to the About Page as it can be seen on top of the main Timeline right below your profile photo. It’s a good idea to add your store’s URL here so fans can easily spot it rather than them looking for it on another page. 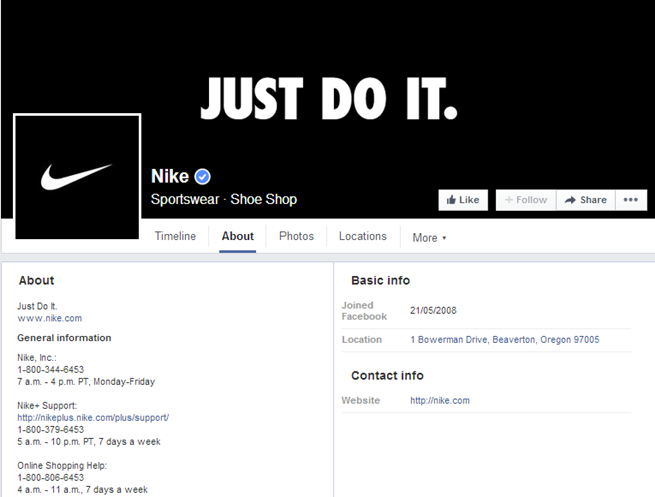 Believe it or not, some Facebook users sometimes find it difficult to locate the store’s URL if it’s NOT found on the About Section. To display your other social profiles links so your Facebook fans can easily follow you on channels like Twitter, YouTube, LinkedIn, etc. The point here is not just to show a description of your store but to incorporate words that would promote actions and directions so you can lead your Facebook Fans to where you want them to be. Although you can actually add a lot of texts and descriptions to your About Page, only a few characters will show on the About Section. Make the most out of 140-145 characters so to make sure all your texts will appear both on the Fan Page and the Search results. And this should be useful enough for both SEO and your Facebook fans who most likely visit your Timeline instead of going through your About page. You can include the following contents to your About Section so you can optimise its use. Important keywords. These keywords should be rich enough to describe your store or your products in a way that will most likely be used by people to search for you. A URL or link to your website. 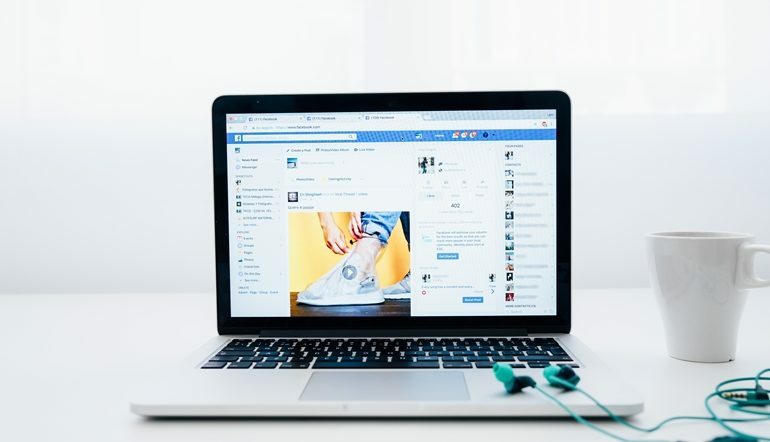 You don’t want your Facebook fans to be leave your page with nothing, you need to direct them to your store so they can check out your products and your offers. Note: Don’t just provide a URL, provide a clickable URL. To make sure that it appears as a clickable link, always start with “http://” on each link. An email address, a phone number or address if you have. Just in case they want to contact you, a contact information will be useful. A “Call to Action” words. This would lead your fans to like, follow you, or visit your store. Take a look at the following eCommerce About Pages so you’ll get a starting idea how you would like your About Page to appear. Their About Page provides a short, informal, yet friendly description which includes rules that fans can follow when they’re on their page. 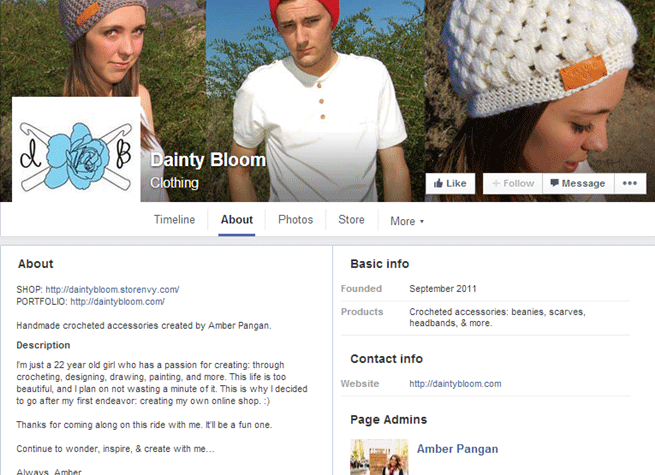 Now we know that Dainty Bloom is created by a young girl. It provides an interesting and friendly description that naturally engage its readers. Their page provides a complete information about them, noting that they also include samples of their client companies. This will draw trust and interest from their fans. Their About Page provides a complete details about the store, and included mission and products. They even highlighted their awards received which is an edge. Provides simple yet complete information. Nike is always not so wordy. 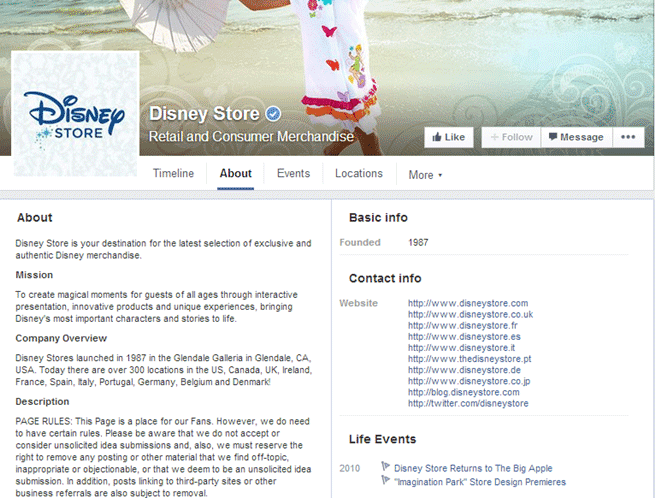 As there are a lot of Disney Stores globally, they included each store’s URL on their Contact Info section as well as their mission, a short history and their page rules. Their About Page includes their physical location as well as their virtual locations. Their life events have provided highlights of their business that can capture the interests of their fans. Here are the About Sections of some eCommerce stores. They may appear differently depending on the categories they have selected. 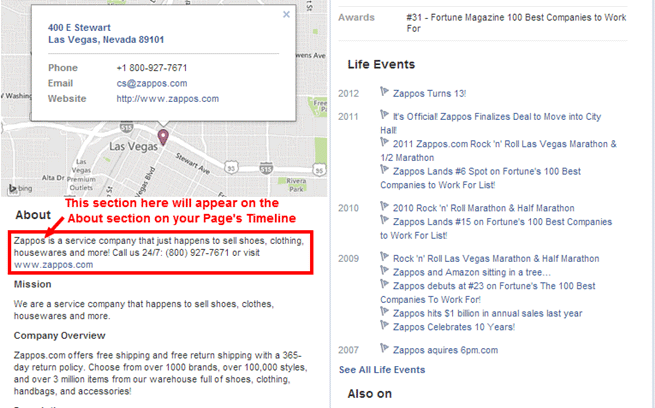 Now, when you look at Zappos‘ page which doesn’t really promote its physical location, you see that it’s About section is in paragraph form. 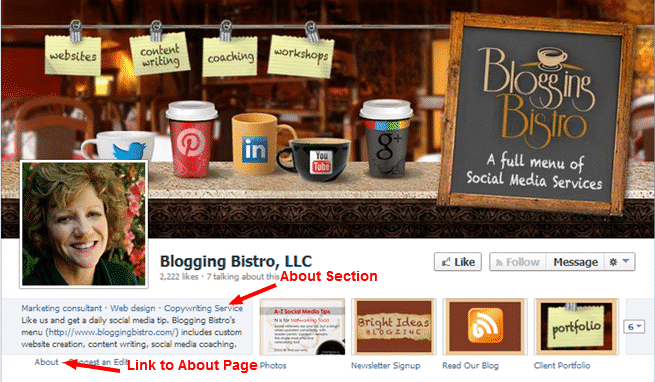 This About section from BloggingBistro‘s page is very interesting as it provides hyperlinks and a call to action to visit their URL’s, as well as a description of what they do. 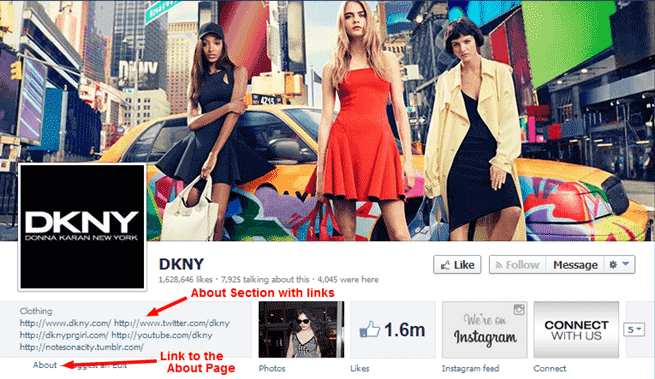 DKNY’s has utilized all its About section to put all its store’s links and other social media links. The Agents of Change‘s Facebook page shows a complete detail of what the store is about, as well as a link where the fans can learn more. Make sure you balance your About Section so that it won’t appear overloaded with keywords or links that would overwhelm your Facebook fans. Review it and check if it’s in a friendly and natural tone so it adds value to both SEO and your fans without being too aggressive with the whole marketing thing. 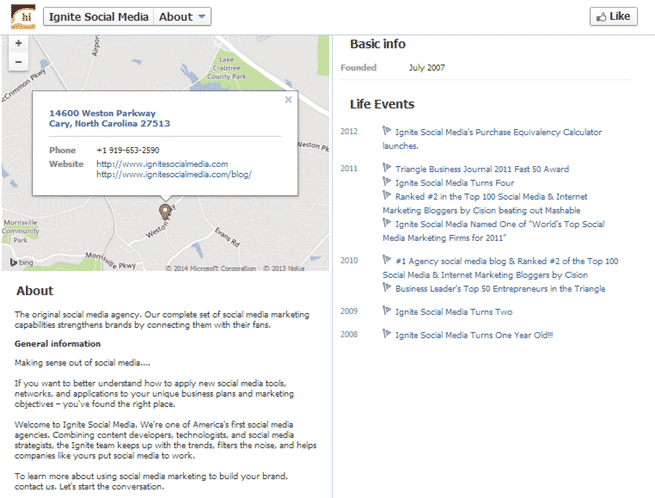 Add accurate, updated and interesting information in your About Page. Create a short but effective About Section in your timeline that would draw your fans interest in knowing more about you and your store. And optimize your About Section by adding rich details and “call to actions” words.